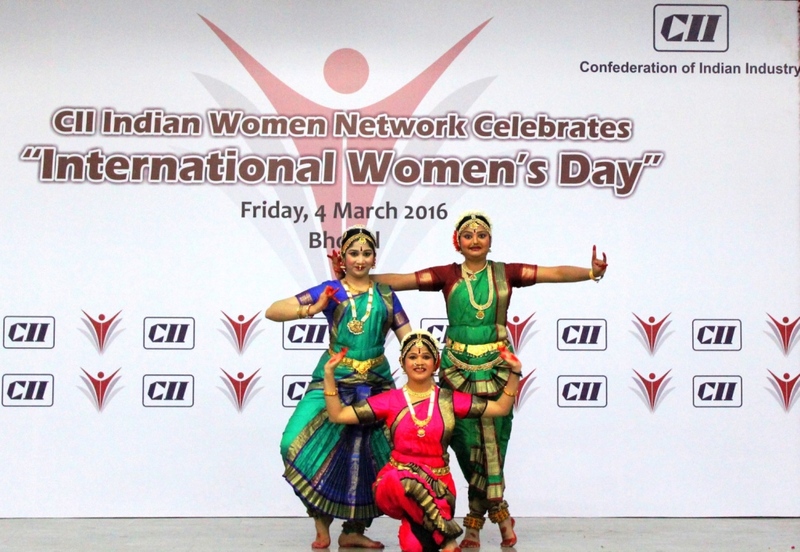 CII Indian Women Network, organised a panel discussion themed on “Engaging to be Empowered” to celebrate the International Women’s Day. The programme began with Lightning of the Lamp followed by Saraswati Vandana sung by student members. A presentation covering a brief about what Indian Women Network has done in the past was presented by Ms. Dipa Prakash, Chairperson, CII Indian Women Network Madhya Pradesh State Chapter. Chief Guest for the programme was Ms, Anuradha Shankar, IPS (Addl DGP Railways). Other speakers included Ms. GV Rashmi , IAS (Director Handloom, GoMP), Ritu Sharma(RJ Palak), Nandita Malhotra, Asst. Vice- President – MNC Bank. The lively panel discussion conducted by Ms. Bhavna Bannerjee, Past Chair, regarding different aspects of working field and the message for young students regarding the empowerment of women was highly applauded by the student members. Questions regarding what was the motivation of these professional people was answered very differently by the speakers. After this discussion, there was a Bharatnatyam performance by students of Ms Bharti Hombal, Director, Kalapadam Bharatnatyam Dance Academy . This programme was coordinated by Ms. Ravisha Merchant. Ms. Anuradha Shankar said that “even after 70 years of independence there is still a lot of work left to be done in the field of literacy in rural areas. A well literate woman is an empowered woman. Why do we need to celebrate a Women’s Day, every day is a women’s day if asked me". “In tribal areas like Dindori, women are more empowered than us. There is no inferiority of being a woman, no ghunghat. Girls are equally enrolled in the school, the only aid required is economic empowerment”, said Ms. GV Rashmi. Ritu Sharma said that “ Women are miraculous and flexible, I see women everyday who are capable of doing any work in this male dominated world” to which Ms. Nandita Malhotra added that “ There are three dimensions, first is self second is self and third is community. All three need to take responsibility for empowerment”. Women from all walks of life including students, teachers, entrepreneurs, house wife’s participated in the programme in large numbers.